Basement of Ghoulish Decadence: An Early Happy Birthday to Count von Count! With awareness of the 40th anniversary of Sesame Street at a high due to last week's themed Google logos, I thought I'd wish an early happy birthday to Count von Count, who turns an almost old as the series itself thirty-seven this coming November 27th. I personally don't have any memories of the Count as a child being too busy dawning a Proton Pack when my memory began archiving. Though that's besides the point. Who would have thought this character inspired by Lugosi's Count Dracula would be a mainstay in the gaggle of otherwise cuddly muppets back in his 1972 debut. Well, "cuddly" excluding Oscar the Grouch. Sorry to get on a soapbox, but it seems like a tiny miracle this compulsive counting Count has survived for so long in this overly politically correct climate that's been stewing for years in American culture. The series is no stranger to recent controversy, with the introduction of an HIV-positive muppet on the South African incarnation, but it's hard to believe some do-gooder group hasn't faked outrage over the Count being obviously based one of horror's most enduring characters. I'm referring to the loonies who want to ban traditional Halloween activities, believe Harry Potter a harbinger of black magic end times, got antsy over Orphan, think Teletubbies is worthy children's entertainment, or the People's Republic of China who banned horror flicks for the Beijing Olympics despite the smog polluted skyline looking like the entire city was ablaze. This might sound a little insane, but Count von Count is one of the last slivers still thriving of a bygone era. A period where horror films weren't viewed as some morally corruptible force to be quietly yet systematically exorcised from the country's small screens even as the age of Jerry Springer and primetime murder shows with cracked forensics was ushered in. In a small way, this pink fanged muppet represents the glimmer in the eyes of many of us who sneaked a verboten late night viewing of an old Hammer classic or an '80s chestnut while being regaled by some goofy horror host with fog machine full blast as our parents slept. 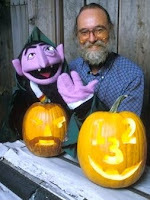 If anyone has a problem with the Count; he's taught countless children the importance of nailing down the rudimentary base of Arithmetic and to not be so fearful of the fake frights on television as they just might be among cherished memories later in life. Only one question remains, whatever happened to Countess von Backwards? Well said. I could not agree more!